A couple of years ago, I received a very nice Christmas gift from my best friend Annie. It was a John and a Paul action figure. Every now and then I think about how cool it would be to have a complete group. It wasn’t until very recently that I started searching for George and Ringo. I guess I was hoping to get George and Ringo from Annie for my birthday or the following Christmas, but, since a couple birthdays and Christmases have gone by, I think it is safe to assume that I am going to have to purchase George and Ringo on my own. I never expected to have any trouble finding George or Ringo, but I was very wrong. Annie got John and Paul for like ten dollars. I wish I could be that lucky with George and Ringo. Through extensive searching I have found George for the reasonable price of a little over twenty dollars on Amazon. If you search for Ringo on Amazon, nothing. If you search for Ringo on eBay, nothing. I have been lucky enough to find the whole gang together, but the cost of that was almost one hundred and fifty dollars. I finally just did a broad google search for Ringo. I found him in stock on one website for about eighty dollars and on another for about seventy. One site I found him for a wonderful price of twenty-five dollars, but, alas, he was sold out. Every website that had Ringo for a good price, was sold out. What is the cause of this anomaly? Well one hypothesis I have heard was that Ringo cannot be found, because no one likes Ringo. That is very plausible, but I have another hypothesis. I think Ringo is just so popular, that he is sold out everywhere. I think the makers purposely didn’t make enough Ringos to drive people like me crazy. Now I am faced with a dilemma. Do I by Ringo for a ridiculous price and just ignore the amount of money I wasted buying him? Do I buy the group of four and try and sell the John and Paul I have grown to love? Do I just live with the fact that all I will have is Paul and John? I mean how fair is that to Paul? John is dead! And what about John? He is dead! 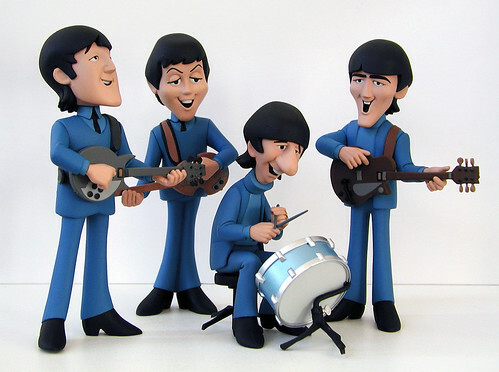 If I was able to get Ringo and George, the whole gang would be happy! Paul would have a live Beatles to talk to and John would have George as a dead buddy! For now, Paul and John and my Mr. Bubble bottle are just going to have to keep each other company until I either inherit enough money to pay for school and ridiculously priced merchandise, or have the rest of the gang magically given to me. Inherit? Like, you’re hoping one of our family members die…himm..
That being said I have a cold, so good luck with that. Make sure whatever you find is the same company/brand, because it’d be weird if multiple companies made them and they were all slightly different, it’d be weird. Hmmm, an interesting dilemma, indeed! How much are Paul and John going for on eBay? If it’s as much as Ringo by himself, it might be worth it to try and sell them and use the money to buy the whole set. I agree with Holli. You should start collecting Rolling Stones figures instead. The Beatles are a gimmick and a fad. I don’t think that’s agreeing with me at all.